Yesterday was the 11th quarterly meeting of Kaleidic Economics, and the topic was Tyler Cowen's 2011 thesis on "The Great Stagnation". There is a TED talk with Cowen here. The report is called "Welcome to the great stagnation". All of our reports are here. 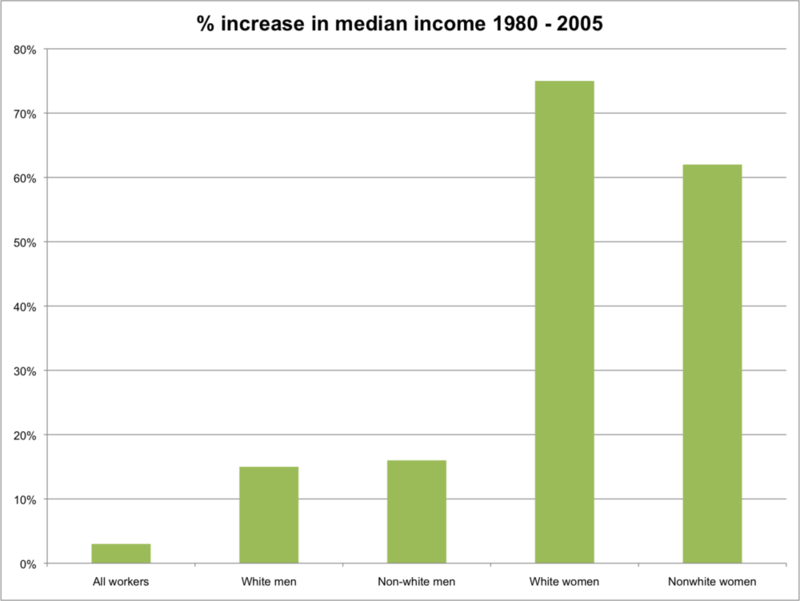 Here's a chart showing the breakdown of the increases in median incomes in the US, from 1980-2005. The data comes from Steven Landsburg. He shows how median income for all workers rose by just 3%, but that this masks what was happening within different groups. Since women represented an influx into the labour market, and their wages were typically below median, this dragged down the total. But every group rose. Overall though we are sympathetic to the view that the rate of growth in incomes, productivity, and technological innovation has slowed. This doesn't necessarily mean that living standards are falling, since we are getting better at learning how to consume the technologies that we do have. We can be utility optimists but output pessimists. This report confronts Cowen’s argument, and considers how it relates to some specific questions relating to the UK economy. In particular, why has productivity nose-dived since the recession? And are lower growth rates, and lower interest rates, part of a “new normal”?